A classic sedan with quality first construction, the 42' Sabre. She's perfectly sized for a cruising couple and two guests in her clever, lounge-that-converts-to-a-second-stateroom. This pretty 2006 example is an original owner boat, kept in the upper Chesapeake since new. Lightly used, her 480hp Yanmar diesels (with only 524 hours) are quiet, economical, and made for spirited performance on this great riding hull.SEE THIS BEAUTIFUL BOAT AT THE ANNAPOLISBROKERAGE SHOW, OCTOBER 11-14! United Yacht Sales New Jersey would love to guide you through a personal showing of this 42' Sabre 42 Sedan 2006. 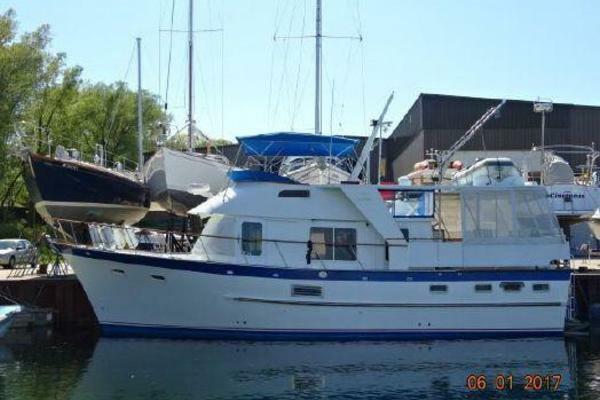 This yacht for sale is located in Grasonville, Maryland and priced at $429,000. For a showing please contact us by filling out the form on this page and we will get back to you shortly! The Sabre 42 has become the standard for performance cruising motor yachts. She is offered with and without bridge and a hard top extension which covers the cockpit is a popular option. The extension, when equipped with a dinghy lift is an ideal place to store a hard bottom inflatable dinghy. Her deep-vee hull offers cruising speeds from 20 to 27 knots depending on engine choice.With the largest engine option she can sip fuel at an economical 1.1 gallons per mile at 25 knots. Wide side decks with large diameter stainless steel hand rails, standard rope chain windlass and highly polished aluminum hatches all add to the beauty and functionality of her deck.A large double anchor roller makes anchoring work a breeze. Access to the bridge is safe and secure thanks to a well engineered set of steps with large diameter hand rails. The bridge deck with L-settee and table, and the captain and mate chairs, is the ideal place to pass your day on the water.The galley-down standard layout offers more space in the main salon. A large master stateroom is forward and private access to the head with enclosed shower stall. The guest stateroom to starboard is equipped with a pull-out double with another single berth over. The guest stateroom is equipped with many drawers and a hanging locker. French doors enclose this luxurious space. The galley down allows for a larger salon. The galley is beautifully trimmed in Cherry cabinetry and corian countertops, storage cabinets, tamber doors and galley sole.